For a true coffee connoisseur, one of the finest cups of coffee is one made by a French press style coffee maker. A French press delivers the full flavor of the coffee bean, and its essential oils, to provide a delicious brew. It can also deliver a perfect cup of tea. Those who use them, swear by them. One option to consider is the KONA French press system because of its unique features compared to similar coffee presses. But does it stay true to making an ideal pressed cup of coffee? Is worth investing in a KONA? In this review we will take a closer look to see what the KONA French press is really like. The KONA French press works like all French press coffee makers. Coffee or tea is placed in the bottom of the pot, and hot water is poured over it. The lid and plunger are then placed on the pot, without depressing the plunger. The water steeps the tea leaves or coffee grounds, and after 3-4 minutes, the plunger is pushed down. The press then keeps those grounds at the bottom of the pot while you pour the beverage into your cup. See our French press how to guide for more details on the brewing process. 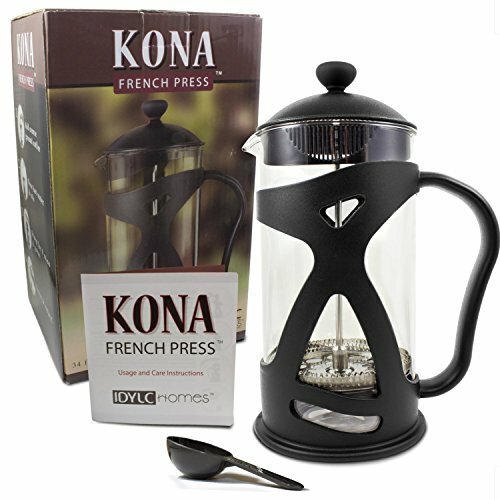 Who Is The KONA French Press For? The value proposition of any press is that it makes a pure cup of coffee by extracting and brewing any coffee or loose tea and its essential oils into the carafe. There is no need for filters or pods, and they deliver a great cup of espresso, coffee, tea, or even iced coffee or tea. The full flavor of the coffee emerges in the cup, rather than being filtered through paper or a pod. The KONA press has some unique benefits over the average press! First, the glass pitcher is made of extra thick “borosilicate” glass, a unique type of glass that has a high tolerance to heat and severe temperature changes. While coffee pots would obviously share this property, the KONA’s glass has the additional protection of an insulated outer shell. This means the glass can withstand what you put in it, and the outer shell is better able to withstand how you treat it! This is a highlight for me as a great property, a nice change from the thin metal frames on other press coffee makers. The plunger consists of a three-piece stainless steel infuser filter system. The plastic lid is BPA free, but in fact, it doesn’t even come in contact with your beverage while steeping. 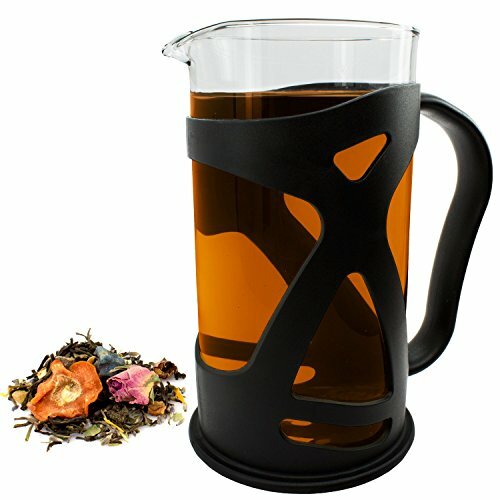 The handle is comfortable and durable, making for easy pouring. The KONA is also easy to clean. The stainless steel filter screen system detaches easily for cleaning. And, the KONA is dishwasher safe but may not be the best way to clean a french press. I like the fact that it’s quiet! If you live in a household where one person gets up early, a pot of coffee can be brewed quietly, as long as the beans are ground the night before. This would also be ideal in an office environment if you want to brew your own coffee and have it at your desk. You can even take the KONA traveling, and camping, as it is durable and easy to use. The KONA is 34 ounces or 1 liter so that it can make 3 to 4 cups of coffee with each brewing. It is about 10 inches high, and is light, making it easy to use and also to take with you. You will want to use a fairly coarse coffee grind size, so it is up to you whether you want to grind fresh beans at home or purchase ground coffee. I like fresh ground at home because I find that it produces a better flavor compared to pre-ground grocery store coffee. You will have to figure out your preference for the amount of coffee or tea to put in the brewer to achieve your ideal flavor. My experience with other French press coffee pots is that the glass is somewhat fragile, particularly when I am banging around in the morning trying to get that first cup of coffee into me. As well, if you travel or camp, it isn’t always feasible to take your press with you. But the KONA coffee press has an insulated cover that makes it more durable, and better for transporting. The three-piece filter system works well and comes apart easily for cleaning. The pot is also easy to clean. What I don’t like is that the coffee can get cold quickly in the pot, particularly if I don’t consume the 3-4 cups quickly. It also may not be the ideal system if the people in your household like different brews or strengths of coffee. While the pot doesn’t require electricity, you still need access to hot water. That can be accomplished with a stovetop kettle, a plug-in kettle, or by heating water on the stove – or your campfire! And if you want fresh ground coffee, you will also have to add a coffee grinder as a necessary accessory. The KONA is ideal for people who are coffee connoisseurs, who appreciate a good, true cup of coffee. I also think it’s great for people who have a taste for a bit stronger brew, or stronger tasting cup of coffee, and those who like espresso. If more than one person will be using it, it’s best that you the same taste for coffee. If one person likes a stronger brew than the other person, a press system may not be ideal. It’s also great for those who like 3-4 cups of coffee made at a time. KONA is also ideal if you want to take an easy type of coffee maker to the office when traveling, or even camping. You don’t need electricity for the coffee pot, but you do need to have access to hot water. Not impressed with the KONA? Check out our French press reviews for more coffee maker buying options and considerations. What beverages can be made in this type of brewer? You can make espresso, coffee, chilled coffee, tea (using loose leaves) and chilled tea. How difficult is it to use compared to a regular coffee pot? The press system is actually very easy. You need coffee (or tea) and hot water. There’s no need for filters or pods or any other accessory. You put the fresh grounds or loose tea in the bottom of the empty pot, pour hot (not quite boiling) water over the top, place the plunger system in the pot without pressing the plunger down, let the coffee steep for about 4 minutes, then plunge and pour. What type of coffee and tea is needed? Coarse ground coffee is ideal. It is up to you whether you buy ground coffee, or purchase a grinder and grind fresh beans. If you want to make tea, you need loose leaves, not tea bags. How many cups of coffee does it make? Its volume is 34 ounces or 1 liter so that it will make 3-4 cups of coffee per brewing. A French press system is a pretty basic system, with not many variations in the basic design of the pot or plunger/press. The construction of one system vs. another is the only way to compare them. One improvement could be made by bundling the KONA with a necessary accessory, like a kettle that holds the exact amount of water for one pot, or a manual coffee grinder that would be ideal to take camping or traveling with your KONA. But this may not suit those people who already own such accessories, and just want a French press. In that regard, the KONA and its insulated cover is a good press system. The top competitor to the KONA, and probably the best-known French press system, is the Bodum, known as the “original” French press coffee maker. The Bodum Chambord, for instance, also features a three-part stainless steel filter/plunger and is also dishwasher safe. The Bodum has a stainless steel handle system, so there is no protective insulation like the KONA. But it has 4 size options (.35 liter, .5 liter, 1 liter and 1.5 liters) and several color options for the handle system, depending on the size of the pot and availability. Color can be important to some! 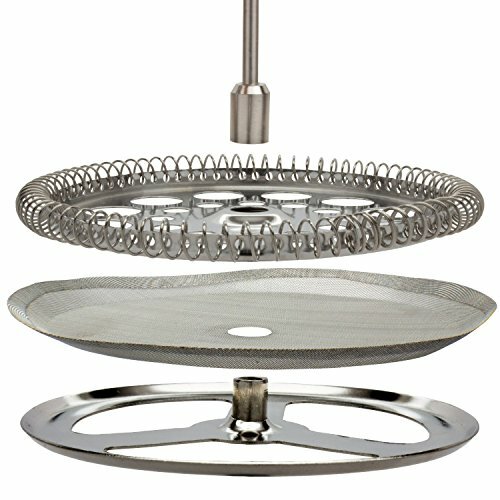 There are also options for a stainless steel pot, rather than a glass pot. These include the Secura Stainless Steel French Press Coffee Maker. It has a steel interior and exterior, which provides thermal retention, but a cool touch handle and knob. A French press coffee system is ideal for coffee drinkers who want a pure cup of coffee. It delivers a bold, Barista-style coffee right at home. You can also make espresso, tea, and chilled coffee or tea. The KONA French Press has some added benefits, such as an insulated cover that makes it more durable and better for transporting. But if you don’t want three cups of coffee at a time - or you want more than three cups, or if the others in your household don’t share your love of bold coffee, this may not be the best option.